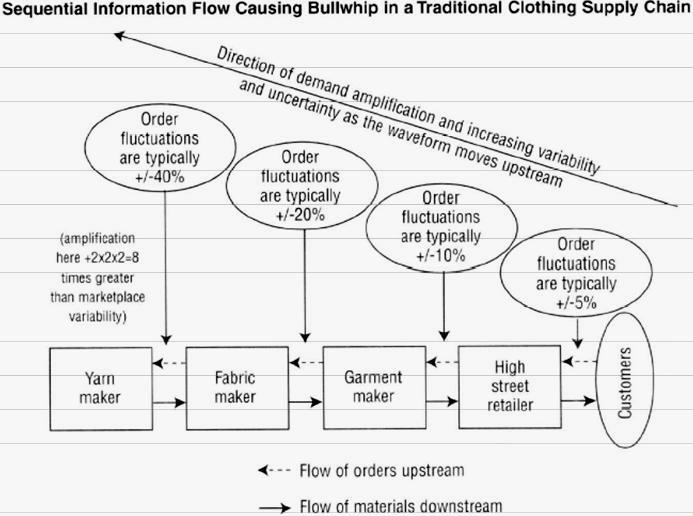 Bullwhip effect (or Whiplash Effect) is a recurring phenomenon in inventory management and order demand forecasting. The orders to upstream members of the supply chain (e.g. producers of raw materials) exhibit greater variance than actual orders demanded by the end consumers. The below graphic demonstrates the variance between retails sales and orders shipped by manufacturers to distributors due to seasonality. The variance grows with each additional member of the supply chain. This entry was posted in Strategy and tagged bullwhip, bullwhip effect, bullwhip effect analysis, whiplash effect by admin. Bookmark the permalink.